Sophomore U.S. Rep. Marc Veasey, D-Fort Worth, appears on track to coast to a third term representing his hybrid Dallas-Fort Worth seat in Congress. "Appears," being the operative word. DALLAS — Sophomore U.S. Rep. Marc Veasey, D-Fort Worth, appears on track to coast to a third term representing his hybrid Dallas-Fort Worth Congressional district. "Appears," being the operative word. The 33rd Congressional district is safe Democratic territory. But it's primarily Dallas and mostly Hispanic, while Veasey is a Fort Worth-based African-American. Although no Democratic rival has surfaced yet to run against him, Veasey knows he's vulnerable if the right candidate challenges him. "I feel great, but ... I'm not taking anything for granted. I'm going to go out here and work hard like I hope every member of Congress is doing." Veasey said Monday night after a women's event that drew women of all races from both sides of the district. "There are a lot of people who have a stake in seeing him succeed," said former state senator and Democratic gubernatorial nominee Wendy Davis, who served on the event's panel. Notably, Congressional Hispanic Caucus Chairwoman Linda Sanchez also attended the event. The California congresswoman was already in the state for a fundraiser for U.S. Rep. Filemon Vela in South Texas. That she attended the North Texas forum was striking. Sanchez could, in theory, benefit if Veasey lost his seat to a Hispanic, with the Hispanic caucus gaining a member and a little more clout within the House Democratic caucus. "I had an opportunity to get to know Marc Veasey," Sanchez said of his years in Congress. "I think he's tremendously talented, I think he's got a level head on his shoulders, and I like him personally. He's trying to do what is best for his district." Veasey was closing in on a half-million dollars in cash on hand for his re-election campaign when he filed his third-quarter campaign finance report last week. The Texas primary is March 1. Candidate filing begins Nov. 14 and ends Dec. 14. Veasey's most prominent rival, former state Rep. Domingo Garcia, told The Dallas Morning News earlier this month he would "probably not run" against Veasey, unless a federal court changes the district lines. In late 2013, Veasey faced a surprise challenge when businessman Tom Sanchez filed to run against him at the last minute, going on to spend $1.2 million of his own money on his bid to unseat Veasey. The congressman trounced Sanchez, but Veasey did have to mount an engaged re-election campaign. Residents of Fort Worth take this seat seriously. African-Americans on the city's east side are organized and effective at turning out the vote. In a nod to that bloc, Garcia has made an effort to register the district's Hispanic voters in hopes of pulling the seat out from under Veasey. "I am so sure he'll win again, because I'm going to see to it," said Opal Lee, a precinct chairwoman on Fort Worth's east side. The 89-year-old retired educator traveled to Dallas for the event. Fort Worth's affluent west side also plays a role in keeping Veasey in office, even though U.S. Rep. Kay Granger, a Republican, represents them. Perpetually overshadowed by its larger neighbor to the east, bold-faced Cowtown names and wealthy zip codes line Veasey's campaign finance reports. "Fort Worth has always prided itself on its historic districts," said Davis, a west side resident. "It's important for the Fort Worth community to feel like they have a voice even if the boundary lines don't necessarily include their neighborhood, and they know that Marc Veasey is a voice for the community." Davis further argued that the loss of her old Fort Worth state Senate seat to now-Sen. Konni Burton, R-Colleyville, is cause to support Veasey on a federal level. "They no longer have a senator who represents and lives in Fort Worth for the first time in decades, and I think they understand and cherish those in office who come up through the community, care about the community, who are working hard to bring policies forward that will be beneficial to the community." And after nearly two terms in office, Veasey has made inroads into the Hispanic community. Mostly. 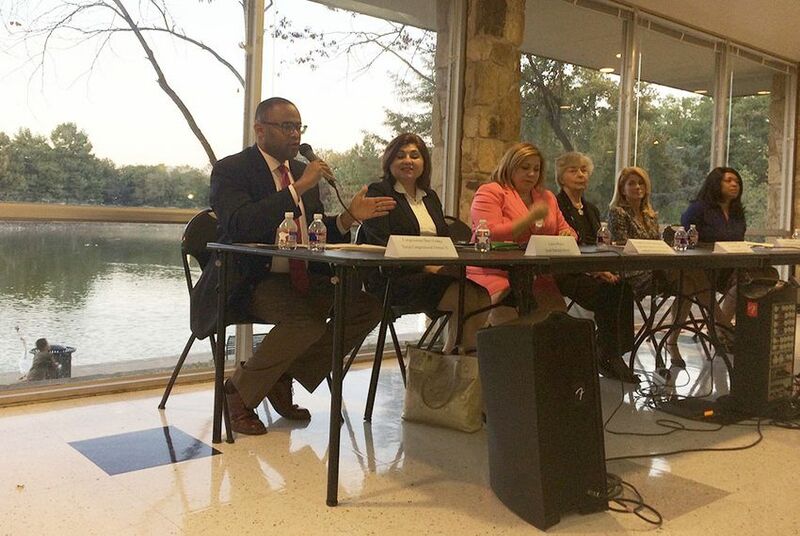 "Although it is a Latino-opportunity district, our district has spoken and has elected congressman Marc Veasey," said Celina Vasquez, a state party committeewoman. That Sanchez traveled to Dallas was also key to Vasquez. "He has been at the forefront of immigrants' rights issues. He has brought the chairwoman of the Congressional Hispanic Caucus to come to be part of this women's forum," she said. "So, Congressman Veasey has been doing everything that's right." But the love for Veasey on Monday night was not complete fidelity. Asked if there was a hypothetical person who could file to run against Veasey and steal her support, Vasquez quietly paused. Her friend, Irma Perez, who is from a part of Fort Worth not inside the 33rd's lines, chimed in: "Well, yes, there's always somebody, because it is a Latino opportunity district, and he knows that."